Feeling like it hadn’t made a special edition in the past five hours, and that they’ve been far too colourful lately (, , wine , , and of course ), McLaren Special Operations (MSO) division decided to up the black factor in its line of bespoke creations. The carmaker's latest, as you may have guessed from the “Black Collection” name, is very black, and that is just fine by us. Rob Melville, Design Director at McLaren Automotive introduced the car in Batman’s favorite color by saying, “Black is a colour associated with elegance, power and authority whilst also surrounded by a certain air of mystery. The end result remains true to the luxurious nature of the but we managed to further amplify its sleek, sporty character with a wealth of new MSO Defined options which I am sure will delight discerning owners.” Just how black is it? The paint job is called “Carbon Black”, a new shade of deep, glossy black developed by MSO complemented by front and rear splitters, side skirts and air intakes in black instead of the usual Dark Palladium. The only thing not pure black on the exterior are the logos, lights and the polished finish of the five twin-spoke lightweight forged wheels – even the brake calipers are black with dark, dark gray carbon ceramic brakes. Stepping inside, the interior introduces a new MSO Black Collection Trim, which translates into Jet Black Leather with Black Alcantara accents pretty much everywhere, except the Bowers & Wilkins speaker covers, which are a dark, dark gray again, with a coppery highlight peeking through. And hey, guess what, even the key fob is specially painted in Carbon Black, and hidden within the center console is a just-for-you “Dedication Plate”. There is even an optional Electrochromic Panoramic Roof that can shift from clear to black, with five levels of tint thanks to ‘smart glass’ tech. MSO didn’t settle for just aesthetic upgrades, and also tacked on some extra performance goodies for the price of $250,000. As mentioned, the brakes are carbon-ceramic discs, while a new “Sport Pack” gives drivers the sharper dynamic settings of the more sporty 570S. 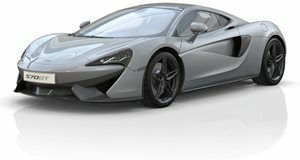 And for that price, McLaren throws in the GT Upgrade Pack, which includes Vehicle Lift, Rear View Camera, Power Adjust Steering Column and 12-speaker Bowers & Wilkins Audio System. The final touch is both performance and visual: Titanium SuperSports Exhaust with Nano Black finisher, which saves 11 pounds over the stock exhaust and amps up the exhaust with a louder, crisper tone. MSO Defined will only be creating 100 of these Black Collection models, and deliveries will begin this summer.